One of the most significant developments of the post-Cold War era, and certainly the most ominous, is the transformation of the North Atlantic Treaty Organization (NATO), a military bloc created by the United States during the genesis of the Cold War in 1949, into one that has grown to encompass the entirety of Europe, has expanded military partnerships throughout the world and has waged war on three continents. Ahead of, during and after the North Atlantic Treaty Organization’s 25th summit in Chicago on May 20-21, the Pentagon has continued expanding its permanent military presence in the former Yugoslavia and the rest of the Balkan region. Though infrequently acknowledged if even given consideration, the current historical period remains what it has been for a quarter century, the post-Cold War era. Beginning in earnest in 1991 with the near simultaneous disintegration of the Union of Soviet Socialist Republics and the Socialist Federal Republic of Yugoslavia – instantaneous in the first case, comparatively slower in the second, only complete with the independence of Montenegro in 2006 – the bipolar world ended with the demise of the Soviet Union and the Warsaw Pact and the nonaligned one with the fragmentation of Yugoslavia, a founder of the Non-Aligned Movement. The State Department’s top Eurasia hand addressed the House Committee on Foreign Affairs’s Subcommittee on Europe and Eurasia on April 26 to present Washington’s perspective on and expectations of next month’s summit of the North Atlantic Treaty Organization. In a presentation titled “The Chicago Summit and U.S. Policy,” the Principal Deputy Assistant Secretary for European and Eurasian Affairs, Tina Kaidanow, laid out what the military alliance’s main powerhouse and financial backer demands of its 27 allies and in so doing indicated many of the top geopolitical objectives of her department and the U.S. government as a whole for the upcoming years. This is Part I of our three-part one-of-a-kind interview series with author and researcher Paul Thompson. For additional background information please visit the complete 9/11 Timeline Investigative Project at HistoryCommons.Org and Richard Clarke’s interview by John Duffy and Ray Nowosielski at SecrecyKills.Com. (ROME-BELGRADE) NATO seems to find Serbia’s autonomy outrageous, its semi-neutrality unacceptable, its modernity anomalous and above all its path to progress dangerous. For North Atlantic Treaty planners and schemers, Serbia—maverick, outsider, rebel—is an infectious disease to be eradicated. Serbia must be chained, normalized and integrated with the rest of Europe as are most southeastern European lands. Serbia’s neutral existence is an affront, an obstacle to a final solution of the thorny Balkan conundrum. This week plans for U.S. and North Atlantic Treaty Organization military intervention in the Baltic Sea region gained attention after information from American State Department cables released by WikiLeaks were published in Britain’s Guardian newspaper. Details include the alleged military defense of new NATO members Poland, Estonia, Latvia and Lithuania against Russia by nine NATO divisions composed of troops from the U.S., Britain, Germany and Poland – as many as 100,000-200,000 or more depending on the size of the divisions – U.S. and British warships and assault forces, and warplanes from the U.S. and other NATO nations. With the expansion of the North Atlantic Treaty Organization into Eastern Europe from 1999-2009, the U.S.-led military alliance has grown by 75 percent, from 16 to 28 members. By 2009 all former non-Soviet Warsaw Pact member states had been incorporated into NATO, the former German Democratic Republic (East Germany) being absorbed with its merger into the Federal Republic in 1990. 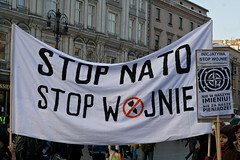 The Czech Republic, Hungary and Poland joined NATO in 1999 and Bulgaria, Romania and Slovakia in 2004. Albania, which suspended participation in the Warsaw Pact six years after its founding, in 1961, was brought into the Alliance last year. The 2004 expansion included seven nations in all, the three mentioned above, the first former Yugoslav republic, Slovenia, and the first former Soviet republics: Estonia, Latvia and Lithuania. Bosnia and Montenegro being incorporated as full NATO members and Macedonia following suit would expand the world’s only military bloc to 31 nations, almost twice that of ten years ago when it first began its drive into Eastern Europe. And with Serbia and Kosovo, which even before becoming a member is the world’s first NATO political entity, included the Alliance’s numbers will have more than doubled since 1999, a decade after the dismantling of the Berlin Wall and the end of the Cold War. All seventeen new acquisitions would be in Eastern Europe, and the majority of NATO member states would be former Warsaw Pact members or Yugoslav republics and a province. NATO Secretary General Anders Fogh Rasmussen visited the capital of Montenegro on November 26 and that of Bosnia the following day. The century’s longest war continues to rage in South Asia with no sign of abating. Instead, the invasion of Afghanistan on October 7, 2001 has exploded into endless armed hostilities that have spread across the length and breadth of the nation, with U.S. and NATO military forces fighting an intensified counterinsurgency conflict in the north, south, east and west of Afghanistan, now paralleled by equally brutal and even larger-scale combat operations in neighboring Pakistan. With over 100,000 Western troops and rumors of perhaps a doubling of that number in the works, and with Washington spending billions of dollars in expanding bases to accommodate those reinforcements, the Afghanistan-Pakistan campaign under the direction of U.S. and NATO military commander General Stanley McChrystal and Special Representative for Afghanistan and Pakistan Richard Holbrooke portends yet greater violence, bloodshed and imperiling of regional stability. Last week was an eventful one in Eastern Europe. In the face of total global economic collapse, the prospects of a massive international war are increasing. Historically, periods of imperial decline and economic crisis are marked by increased international violence and war. The decline of the great European empires was marked by World War I and World War II, with the Great Depression taking place in the intermediary period. Currently, the world is witnessing the decline of the American empire, itself a product born out of World War II. As the post-war imperial hegemon, America ran the international monetary system and reigned as champion and arbitrator of the global political economy. Tensions are mounting in the Black Sea with the threat of another conflict between U.S. and NATO client state Georgia and Russia as Washington is manifesting plans for possible military strikes against Iran in both word and deed.